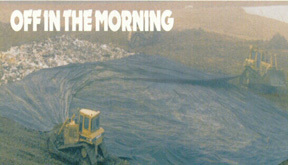 Traditionally, required daily landfill cover consists of soil layer, usually 6 inches or more, applied to working area at the end of each day. 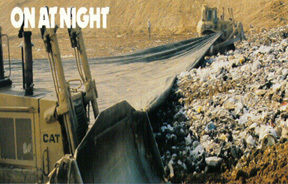 If you are still using this conventional method of daily soil cover, your're wasting valuable landfill space that is ultimately worth millions of dollars in lost tipping fees over the life of your landfill. Additionally, daily savings can also be realized from labor, equipment and soil overhead costs which will more than pay for FILLCOVERÔ and result in additional thousands of dollars of income yearly. FILLCOVER is a high strength polypropylene fabric made into large reinforced blankets which are pulled over each days working area at closing time and pulled off the next morning. This eliminates nightly covering with soil and allows you to start filling right on the previous days pile. Stored out of the way, FILLCOVER is used over and over, day after day - up to 30 or more deployments depending on methods used. In today's world of conservation, with the expanding need for landfill space, and with the potential increased earnings from your present sites, can you afford not to use FILLCOVER? Increases the lifetime capacity of the land fill. Eliminates costly soil and labor cost of daily soil cover. Reduces overhead of costly earth moving equipment. Installs easily with available on-site equipment. Long lasting-30 or more deployments, depending on methods used. Easy to store -does not take up valuable space. Takes minimal time to cover pile, leaving more time to accespt material right up to quitting time. Minimizes dust, erosion and fire hazards. Use discarded covers for road stabilization. 1. FILLCOVER installs best only over well compacted trash. 2. Unroll FILLCOVER panel along face to be covered, then unfold panel over desired area. 3. Attach panel to available equipment with installed straps (or other method chosen) and slowly pull panel across the well compacted working face. It is recommended that the panel be pulled in the same direction of the interior seams. 4. Use sandbags or other heavy material (even equipment carefully placed at corners) to hold the panel in place. Care must be taken to avoid the panel being lifted by the wind. 1. Pull FILLCOVER panel back over itself to minimize the potential of a sharp edge tearing the cover. 2. Pull panel to out of way area and store for reuse that evening, and day after day. Woven is the most cost effective. All interior seams double stitched and reinforced with 3"
All corners can be reinforced. Available with your choice of attachment methods-grommets, pulling straps, pulling rings, pockets, chains, etc. Note:	Property values are "minimum roll average".